A primer on how Wall Street makes money and ways for the Internet to hurt its margins. It’s worth reading as a list of ways you can avoid financial practices that enrich Wall Street and cost you money. Here are two fun charts. The first shows that active management of mutual funds adds no value. The blue line shows the actual performance of actively managed mutual funds after fees have been taken into account. The red line shows randomly distributed results. Even at the right (high performing) end of the graph, the active managers still don’t outdo chance. Put your 401k into index funds. 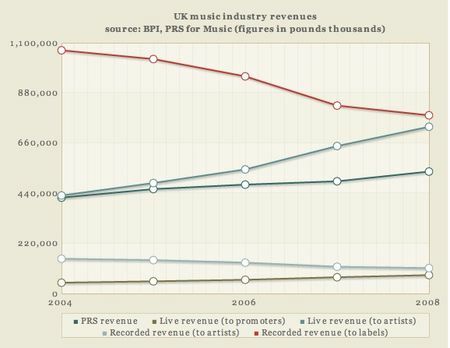 The second chart shows that while record labels are suffering, actual recording artists are seeing their income increase. This maps pretty closely with what I’m seeing in the music industry. Lots of great music being made, lots of good shows out there to go to, and increasing availability of music at lower prices. The changes in the music industry are good for consumers, and it looks like they may be good for artists as well. The fact that they’re bad for record labels is a bonus.